From out of the attic, many treasures emerge - most often in the form of family photographs. Though yellow and aged with time, these precious mementos can bring back powerful and happy memories. When Frankie's Mom recently sent him a collection of family photographs, there was one in particular that captured a unique perspective. In this shot, carefully restored by Melissa Schweitzer, 10 year old Frankie poses on his Schwinn Orange Krate Sting Ray bicycle, and the photo captures an image of a confident, happy boy who seemed to know, almost instinctively, that riding a bicycle would take him to great places. In spite of his love for bicycling, this precious image appears to be the only one that exists of Frankie at that age on a bicycle. The boy in the photo looks out at us, smiling, his back straight and his posture perfect, his right foot positioned on the pedal, ready to push off. Although smiling, he poses almost impatiently, as though he cannot wait to set off on an adventure. Perhaps that is why few photos of Frankie as a child on a bicycle exist - he simply couldn't stay still long enough for the camera to capture a shot! Knowing Frankie as well as I do, upon seeing the picture, I wondered - did the child in that photo somehow know how significant bicycling would be to him? Frankie's love of cycling started in early childhood. 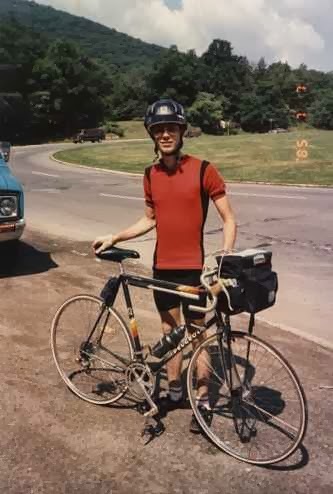 From his hometown of Radburn, NJ, he explored nearby neighborhoods, riding his bike for hours, near his home as well as in the surrounding areas. He rode to school, to town, and everywhere else that he could. When he took on a paper route, his territory widened. The bike became a way to earn some money. And as he grew older, stronger, and more confident, new opportunities came along, and new friends who would introduce him to the world of club riding and long distance touring. As a teenager, mentors taught him how to ride safely and how to channel his strength into speed. Although a happy period in his life, it was at this time that Frankie recognized that less than perfect conditions existed for cyclists, dangerous conditions that threatened their safety. Wanting to make a difference, in his early twenties, Frankie became involved in bicycle Advocacy, which has turned into a lifelong passion that he is devoted to. As he learned more about bicycles and how they work, he also became a proficient mechanic, able to maintain and repair his bicycles. He has mentored and advised countless friends, teaching them to ride safely, sharing his enthusiasm with them. And through the years, the little boy on the Orange Krate has become a man who chooses to ride a bicycle instead of driving a car, a man who has, to date, logged almost 200,000 miles on the many different bicycles that he has owned throughout his life. 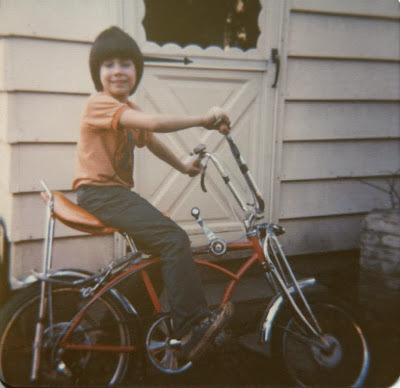 Throughout his childhood, Frankie had several bikes. 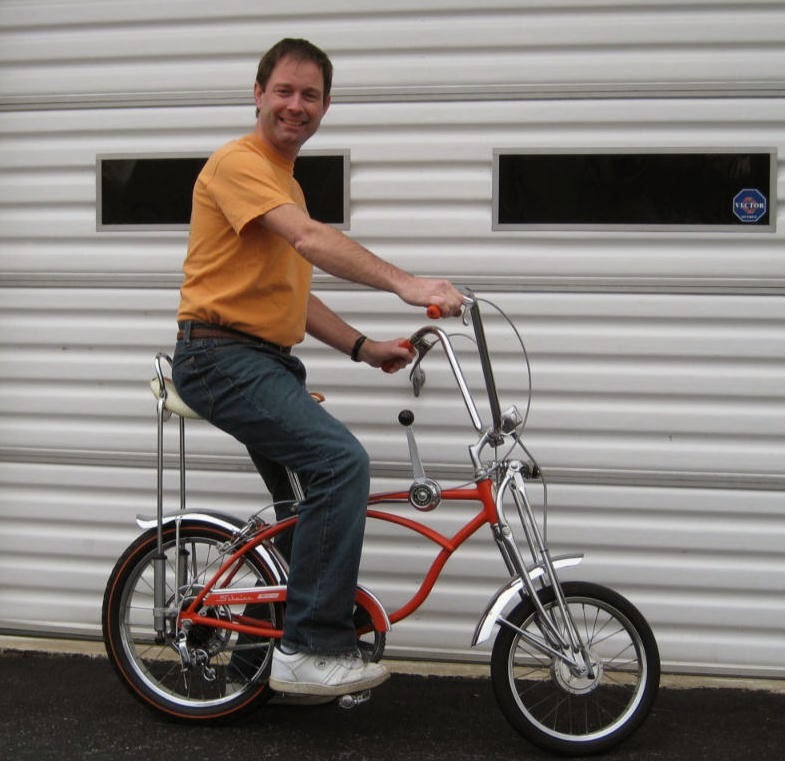 But the Schwinn Orange Krate Sting Ray was his favorite. So we thought it would be fun to re-create the photo that was taken 36 years ago, to celebrate Frankie's lifelong love of cycling. His cycling adventures are now comprised of commuting to work daily, long distance touring with his friends at the White Clay Bicycle Club, volunteering at the Newark Bike Project, advocating, maintaining this Blog, and continuing to mentor and advise friends new to cycling. And like the boy who smiles out at us at age 10, the grown-up Frankie continues to look forward to the adventures that await him.